Sometimes, substituting is straight-forward and to the point. Other times, it can be confusing at best. If you get called into an Art classroom, and you have no background in art, the assignment can be... well, intimidating. If you have no art skills, it may be unlikely that you will know how to teach the lesson the teacher intended to present that day. So, assuming there are no instructions left for you, what do you do? Do you tell the kids to "draw something"? Allow us to suggest an art lesson you can add to your collection of emergency lesson plans. This lesson is cross-curricular, employing students' artistic talents while reinforcing (or introducing) learning in Language Arts. There are many variations of this game, and it can be altered according to student age and needs. 1. Begin by making some word lists as follows: adjectives, nouns, verbs. You should have approximately twenty-five of each (one per student), but if you fall short in a particularly large class, you can easily recycle some of the words. 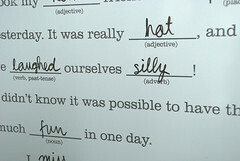 Choose words that are interesting, vivid, and silly (for instant appeal). 2. Print your word list and cut it into small slips of paper. Store in labeled baggies, so you can just pull them out when you need them. 3. Have your students write their names on the back of a paper. Then have them draw words from one baggie at a time. Have them write the word at the top of the paper, then collect the slips of paper before you have them draw out the next word. As they take each set of words they will write them at the top of the paper. They should end up with something like "dangerous chicken dancing" or "slimy banjo flying". 4. Once they have their words, this is what they will draw. (It helps if you model one on the board for them at the beginning of the game). Walk around and encourage them to think of creative ways to draw the words. For example, "smelly" could be illustrated by the classic wavy lines above an object, or you could draw flies buzzing around an object, or you could draw people nearby holding their noses. Students may draw in pencil only, but if markers or crayons are available, it is even better. 5. Show off! Probably students' favorite part of the game is sharing their work and having some laughs. Allow them time to share their work with others. 6. Vary the game. Kindergarteners? Limit the game to two words and help them write them down. Explain definitions as necessary. Older kids? Make it more complicated. Throw in an extra round of adjectives. Or, if you like, play it as a collaborative game by creating groups and giving each group a larger piece of paper. Have each group create one drawing as a team. You have the basic idea now, so change it up and have fun with it. So, why is this better than just saying "draw something"? The game challenges students to draw things they may not have otherwise drawn, which means they have to think outside of their normal box of artistic schema. This is more challenging, and opens up new possibilities to them as artists. Also, it reinforces Language Arts subject matter (and could be played as a filler in an English classroom). Be afraid of the Art classroom no more. Take a few moments to jot down some word lists, and you will soon have a solid, exciting emergency lesson plan for the Art room!